One can relive a lot of history at The Greenbrier resort in White Sulphur Springs, West Virginia, from its founding in 1778, to the Cold War when the U.S. government built an enormous bunker into the side of a mountain to shield Congress and kept it secret for 30 years. Now a National Historic landmark in the Allegheny Mountains, The Greenbrier has 10 lobbies, 682 rooms, suites and guest and estate houses, a 40,000-square-foot spa and 103,000-square-foot casino. 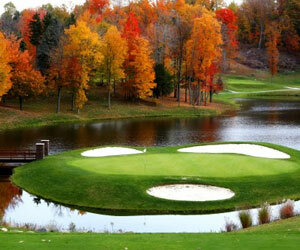 It sits on 6,500 acres dotted with 30 shops, three golf courses and a half dozen restaurants. The Grand Central Hotel, also known as the Old White Hotel, was built in 1858 which became Ashford General Hospital during World War II. After the war, renown interior designer Dorothy Draper redecorated the resort. A touch of celebrity continues at The Greenbrier. Its premier restaurant, Prime 44 West is named after NBA star Jerry West; Draper's, great for lunch and sweets, is named after the designer; and Sam Snead's at the Golf Club is named after the resort's former pro emeritus (now Tom Watson). The Old White golf course was designed by Charles Blair Macdonald in 1914, followed by The Greenbrier golf course in 1924 (renovated in 1977 by Jack Nicklaus), and Robert Cupp rebuilt The Meadows golf course in 1999. Activities range from cooking classes at Greenbrier's Culinary Arts Center, an off-road driving school, shooting sports clays, whitewater rafting and horseback riding.